We did not purposely end up on a tour of the Rangers Ballpark at Arlington, but it turns out that it is included with the admission price to the Legends of the Game Museum, so when we visited the museum on July 23, 2009, we also ended up taking a tour of the ballpark. Mik was quite annoyed that we ended up doing this tour, but we would not even be on this trip if we always gave into his complaining. I was not going to pass up on something that was part of the museum admission, especially since I had thought $12 was steep for just a small museum, but it was not too bad of a price when I learned it included the tour. Anyways once it started he stopped complaining, but it only because he knew there was no turning back and not because the tour was spectacular. 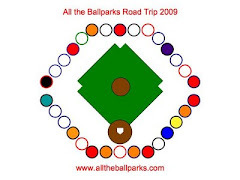 The tour really was just of the behind home plate levels of the ballpark. It involved using the media elevator to go to various floors, which may or may not be the normal tour, as I know in the past ballpark tours have been modified because Mik was on them, but this one did not feel modified, as it was not like there were special accommodations taken into consideration. Thus the tour was overall accessible, but some stops involved steps that made it hard for Mik to enjoy parts, especially the Suite. The first stop on the tour was the Press Room. The press room is located up behind home plate. It is interesting to see, but really not that different than seeing the press room at other ballparks we have taken tours of. At least Mik could roll up to the front and see the view from this part of the tour. The second stop on the tour was the Arlington Suite. Along the way to the suite we could see some of the other suite entrances, which have paintings of famous ballplayers, such as Joe DiMaggio. Just a few feet into the suite are steps, so Mik really just got to see the kitchen part on top of the steps. If you go down the steps you can go up to the sliding doors and see what the view is like. The next part of the tour involved going down in the tunnel below the stands. Not as cool as the unique view of centerfield we got in the tunnel at Yankee Stadium using the wheelchair accessible route to Memorial Grove, but still interesting because we saw some of the behind the scenes rooms. One of the rooms we saw was the room that the Rangers can take indoor batting practice. We also got to see the Media Room, where the coaches, players, etc. give press conferences. The final part of the tour was going into the dugout from the tunnel. The ramp that leads down to it is accessible, but then there are steps up into the dugout. We did not deal with the steps in the Suite, but here Dad took Mik up the steps to get into the dugout. It was kind of cool to go into the dugout, but really it is just the normal end to a rather typical ballpark tour. Honestly the tour disappointed me. There was not really anything special that we got to see. It was all rather dull parts of the ballpark that really could have been any ballpark with even very minimal Texas Ranger décor to make it stand out as your at the Rangers Ballpark. Maybe, it would be interesting if we were at all into the Rangers team, but being an American League team we do not really even know any of the names of players on the team. I did not even get the feel we learned anything about the Rangers history or the ballpark. Sure they have not really been that much of a Championship team, but I got to imagine they have some interesting history. All the tour guide seemed to talk about was how it used to be better without really even saying why anti-Bush things and even that barely got to what he had to do with the Rangers. Basically you could only enjoy her rambling if you already were a Rangers fan and knew about the team management history.